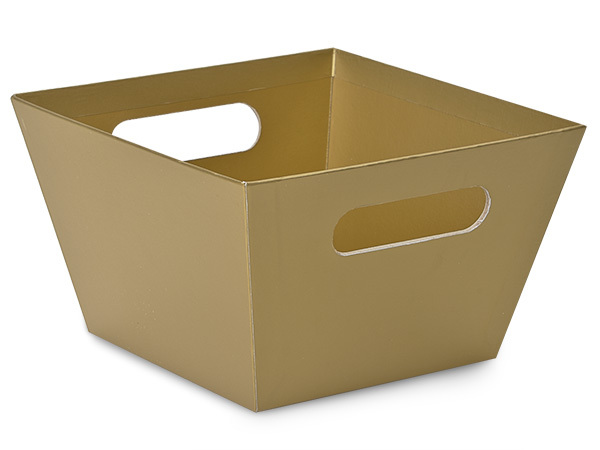 Matte Gold market tray has a gold interior. Base Is 5-7/8" Square; Top Is 8" Square; Depth Is 5". Use with our C18BC Cello Bags or GBB2 Poly Basket Bags. Tape down the bottom corners of the cello underneath the tray for a beautiful presentation. For shrink wrapping, use SB20C for a flat presentation that's even with the tray. Tall presentations use shrink wrap 1424SB.